Bus and train fares will rise by six cents per trip from Dec 29, when the latest annual revision approved by the Public Transport Council (PTC) kicks in. Announcing the changes yesterday, the PTC said student and senior citizen card fare increases will be capped at one cent, while their cash fares will remain unchanged. The rise for lower-wage workers and people with disabilities will also be capped at one cent. Single-trip train fares and adult cash bus fares - which are paid by around 2 per cent of commuters - will rise by 10 cents. The adjustments will translate to an increase of $78.2 million in fare revenue for public transport operators next year. Out of that, train revenue will rise by $35 million - with SBS Transit seeing a $10.9 million increase and SMRT seeing a $24.1 million hike. The Land Transport Authority, which administers bus contracts, gets the remaining $43.2 million. PTC chairman Richard Magnus pointed out that this additional revenue would not be enough to offset the $1 billion annual bus subsidy that the Government expects to pay for the next five years. Even so, he said the council had sought to "narrow the gap between cost and revenue", while keeping in mind the interest of commuters. He said fares had fallen by a total of 8.3 per cent between 2015 and last year. And based on feedback it gathered from 10,400 people, the PTC said 70 per cent of commuters found public transport fares to be affordable, and 60 per cent said they were willing to bear a higher fare increase to mitigate the impact on more vulnerable groups. This year's fare adjustment took into account a new component: Network Capacity Factor (NCF), which calculates the difference between transport supply and commuter demand. This will tend to push fares higher if more transport capacity is created and demand does not catch up. Regular components include changes in core inflation, wages and energy cost. This round, the NCF - which factored in additional buses pumped into the network last year and the first two stages of the Downtown MRT Line - contributed 3 percentage points to a 7.5 per cent increase the formula allowed. However, a carry-over reduction of 3.2 per cent from last year's adjustment means the latest increase comes up to 4.3 per cent, or six cents per trip for ez-link card users. With Singapore's rail network doubling by 2030, Mr Magnus was asked if that meant commuters will have to brace themselves for larger fare increases in future. He said much depends on whether growth in demand matches growth in supply, but added: "I don't think there will be a fare reduction next year." Transport Minister Khaw Boon Wan, in a Facebook post yesterday, said the PTC had a difficult job. "PTC's decision on fares seldom pleases all," he said. "Commuters do not welcome fare increases; operators need fare adjustments to keep pace with their operating costs. Against such challenges, PTC has chosen the right strategy to be open, transparent and fair." National University of Singapore transport researcher Lee Der-Horng described the latest increase as "manageable". "The important thing is we have a workable mechanism for fare adjustments," he said, explaining that PTC's formula "is effective and able to reflect the interests of relevant stakeholders". 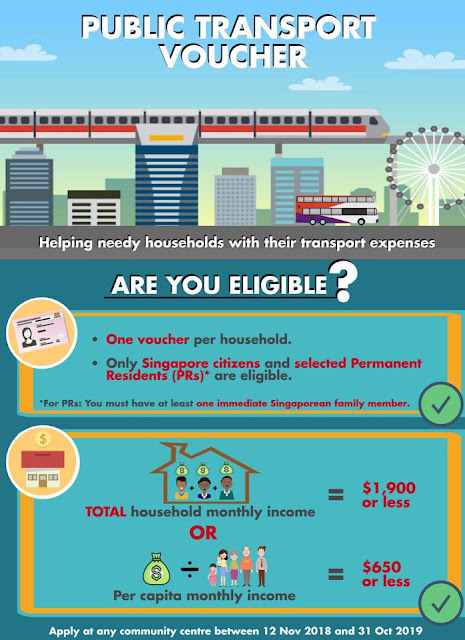 The Government will be giving 300,000 lower-income households vouchers worth a total of S$9 million, to help these families cope with the latest fare increases by the Public Transport Council (PTC). This is the largest such exercise to date since 2010. In 2014, S$7.5 million worth of Public Transport Vouchers were made available to 250,000 lower-income families, and again in 2015. In 2011, S$4 million worth of vouchers were provided for 200,000 households. No vouchers were given in other years because there were no fare hikes. 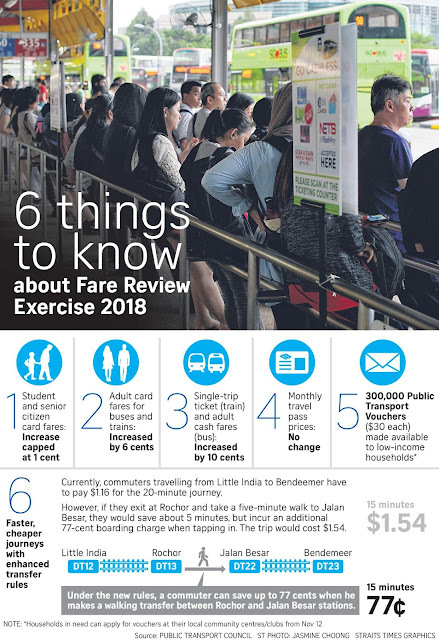 The Ministry of Transport and People’s Association said in a joint media release on Tuesday (Oct 30) that the Government will draw the latest S$9 million from the Public Transport Fund for this round of handouts. Each voucher is worth S$30, and may be used to buy or top up fare cards, or buy monthly concession passes. 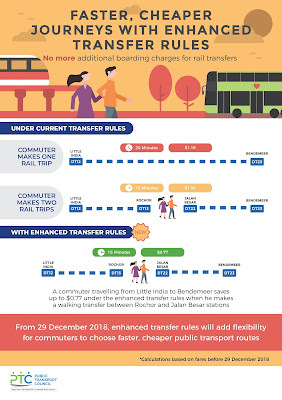 The PTC announced on Tuesday that from Dec 29, adults taking buses and MRT trains will have to pay six cents more for card fares, while single trip on trains and cash fares for buses will cost 10 cents more. Students and senior citizens will pay up to one cent more in card fares for both forms of transport. The price hike was announced after it concluded its fare review exercise for the year, with the fare changes amounting to an overall 4.3 per cent increase. There will be no changes to the cash fares for students and senior citizens, or prices of monthly concession passes. Needy households may apply for the vouchers at their neighbourhood community centres and clubs (CCs) from Nov 12 this year till Oct 31 next year. Each successful household applicant is entitled to one voucher, and those that need more help may apply for extra vouchers through the CCs. Mr Frankie Tan, 49, a warehouse assistant who lives in a rental flat at Teck Whye Crescent near Chua Chu Kang, takes between two and four bus rides a day. He told TODAY that the fare hikes seem “acceptable for now”, but he “cannot tell if this will affect (him) in the long term”. Asked to comment on the latest changes, sociologist Tan Ern Ser from the National University of Singapore said that the financial impact of the price hikes would be “minimal” for lower-income families, particularly if they have access to other sources of financial support. Working on the assumption that each adult spends 12 cents more a day, Associate Professor Tan said that this will work out to S$3.60 a month, which means that the S$30 voucher will absorb the increase for eight months. A lower-income household with two adults earning a combined S$1,500 will then pay S$7.20 more each month — or about 0.5 per cent of their monthly income. While making commuters pay for improvements which should arguably have been there in the first place remains a sticking point, the latest fare revision shows heart. By not raising cash fares for bus rides for senior citizens, and capping rises to one cent for lower-income workers and people with disabilities, the Public Transport Council is shielding vulnerable groups from one of the biggest fare hikes in years. Those who pay cash traditionally bear the brunt of fare increases, because these are costly to process, and the Government wants to encourage cashless payments. But some disadvantaged commuters prefer to pay cash because they do not want to tie up funds in a stored-value card. Anecdotal evidence also shows that seniors prefer buses to trains to avoid longer walks and often, daunting stairs. Many of these seniors need to work too, so not raising cash fares for buses for them is a good thing. By the same token, capping rises to one cent for lower-income workers and people with disabilities goes some way in helping a segment for whom, often, every cent counts. There is more help, in the form of transport vouchers. The Government will disburse $9 million of the Public Transport Fund - which operators contribute to - to help needy families cope with their transport expenditure. This translates to 300,000 vouchers of $30 each - the largest amount handed out here. The PTC has found this targeted approach more effective than sparing a wider population from a fare increase. For one thing, only really needy families will qualify for the vouchers. Two, it sees no reason to spare able-bodied adults with reasonable incomes from bearing more of the fare hike. Six in 10 of those polled by the PTC said they were willing to pay more to mitigate the impact on more vulnerable groups. Still, 60 per cent does not constitute the vast majority. Making commuters shoulder part of capacity expansion is a sound principle. Those who use, should pay. 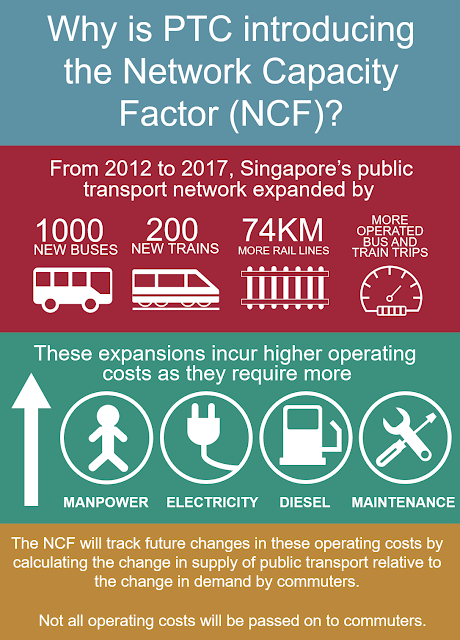 It is reflected in the Network Capacity Factor (NCF), a new component in the fare adjustment formula. In essence, the NCF takes into account the difference between transport supply (for example, new rail lines, additional buses) and commuter demand (how many more people make use of public transport). If increase in supply exceeds increase in demand, NCF will show a positive number, which will be added to the year's fare adjustment. Proponents have argued that the NCF is a proxy for the service quality measure - the more buses and trains there are, the faster and more comfortable the journey. If it is, it is a poor proxy. Because it does not take into account things like bus bunching, which still happens. The operating matrix will reflect a higher bus mileage, but it is of little benefit to commuters who cannot count on bus punctuality, and see three buses of the same service pulling up all at once. It also does not fully take into account the early closure and late opening of the MRT, which has become a regular feature of late. Additional buses deployed to ferry passengers displaced by the early closure and late opening will raise bus mileage, which will contribute positively to NCF. But train commuters who are displaced prefer not to be displaced to begin with; and many will choose not to travel at all during early openings and late closures. This may also contribute positively to NCF. Then, there is the question of rail mileage. Can a rail operator make up for a service disruption or delay by running more trains during the off-peak period? Doing so would be one way of making up for lower mileage brought about by a technical glitch. And ironically, for NCF to show a negative number - and therefore suppress any future fare rise - buses and trains will have to become more crowded once more. While many will argue that the improvements to capacity were late in coming (and after a lot of pain), there is one redeeming quality about NCF - numbers are analysed only after a system capacity increase has been in place for 18 months. This is to allow for the public to adjust to a new MRT line or a new bus service. But a far better approach would be to replace NCF with a component which measures service quality more directly and more accurately. The next fare formula review, perhaps. With huge sums of money being pumped into expanding the public transport network, the formula for calculating train and bus fares is set to change. The formula for public transport fares from this year to 2022 will include a new component that reflects the growing network capacity and ridership. "A widening gap between cost and fares is not sustainable for any public transport network," said the Public Transport Council (PTC), which announced the change yesterday. While PTC said it was too early to commit on whether this new component would mean a fare hike at the next review in the third quarter of this year, it pointed to the need to keep the system sustainable. Nearly 1,000 buses and 200 trains were injected into the network to build up capacity between 2012 and last year, it said. "These capacity upgrades and network expansions are necessary and have been welcomed by commuters. However, they come at a cost," said the PTC. Under the old formula, it said, the fares were not reflecting these costs. Annual operating costs increased by more than $900 million between 2012 and 2016, while fare revenue increased by only $230 million during that time, mainly due to rising ridership. While government subsidies have helped make up the shortfall, it cannot be sustained if it keeps widening, said the PTC. Fares, in fact, have fallen for the past three years along with energy prices, it said. The new component, called network capacity factor, compares network usage against the capacity added. If the capacity increases faster than ridership, a higher fare hike could be allowed. PTC chairman Richard Magnus said consultations with numerous commuters showed that "most were discerning enough to notice the improvements" made to public transport and were expecting a fare increase as a result. "Of course, we will need to bear in mind the affordability for commuters," he said. In a Facebook post yesterday, Transport Minister Khaw Boon Wan said the introduction of the network capacity factor was a "sensible" move. "As the network expands or intensifies in response to changing commuter demand, it impacts the financial sustainability of the transport system," he said. "When changes are significant, some adjustments to fares, whether upwards or downwards, will ensure fairness between taxpayers and commuters." Earlier this month, he had hinted at a possible fare hike by highlighting the need to maintain a high-quality transport system. 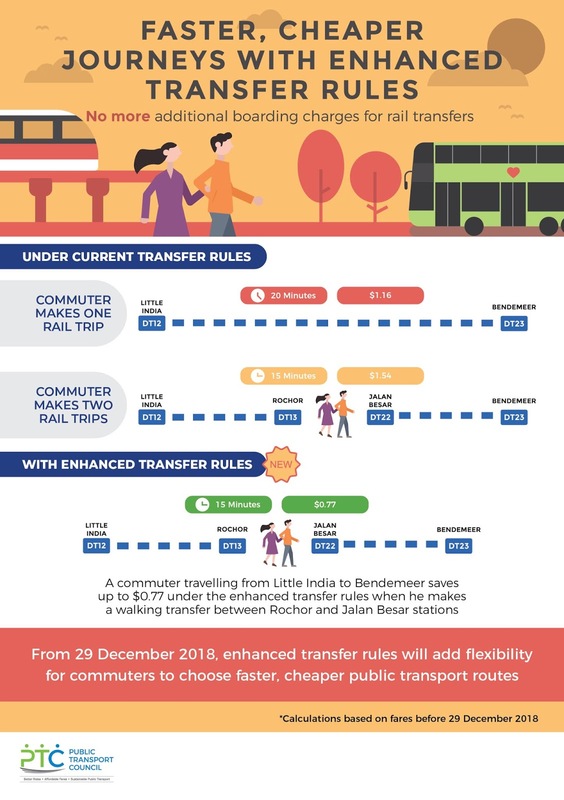 Yesterday, the PTC also announced that from the end of the year, commuters will no longer face additional boarding charges within 15 minutes of transferring between two different MRT or LRT stations. Government Parliamentary Committee chairman Sitoh Yih Pin welcomed the announcements. "The completion of both the fare formula review and the review for the transfer rules bear the commuters' welfare and the financial sustainability of our public transport system at heart," he said. Misleading information about public transport vouchers has been circulating through WhatsApp, the Ministry of Transport (MOT) warned yesterday. 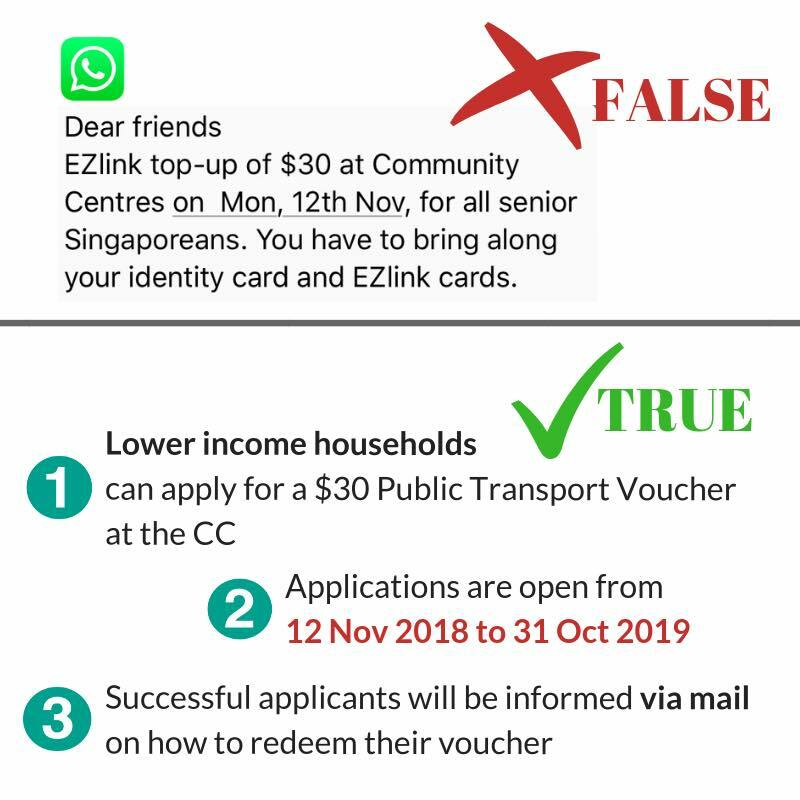 An image posted on MOT's Facebook page shows a copy of a WhatsApp message that states: "Dear friends, EZlink top-up of $30 at Community Centres on Mon, 12th Nov, for all senior Singaporeans. You have to bring along your identity card and EZlink cards." 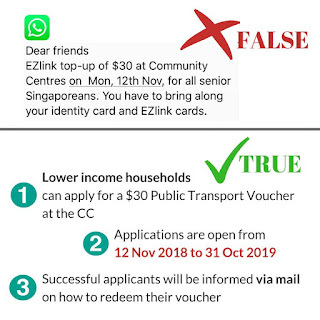 The image was labelled false, with MOT clarifying in its graphic that the vouchers are in fact for lower-income households, and applications run from tomorrow to Oct 31 next year. The graphic added that successful applicants will be informed through mail on how to redeem their vouchers. "You have almost a year to apply for it, no need to rush to the community centre on Nov 12," MOT added in its accompanying post. The Straits Times reported last month that the Government would disburse $9 million from the Public Transport Fund, or 300,000 vouchers of $30 each. The vouchers can be used to purchase or top up fare cards, or buy monthly concession passes. This is to help needy families cope with the recently announced fare increases. From Dec 29, adults using travel cards will need to pay six cents more per trip on buses and trains. Single-trip train fares and adult cash bus fares will rise by 10 cents.